Poll : Is it ok to correct lens distortion in a street photograph ? Any street photographer that uses extensively wide angles lenses has to deal with distortion. Be it vertical, horizontal or barrel shaped, the forms of depicted elements will start to converge or diverge. Ultimately, the scene your experienced will be rendered in a different way than your initial vision**. While an unalterable attribute of film days, digital technology now allows photographers to easily correct distortion, with all the ethical dilemma it might generate. ** this statement is partly true. Our eyes physically see in a distorted way (it is also an optical formula) yet our brain corrects for it. In other words, the picture below shows a distorted church and so did my eyes when I experienced the scene. Nevertheless, my brain overwrote the signal received from the eyes and transformed it to "this church has straight lines". Amazing, isn't it ? 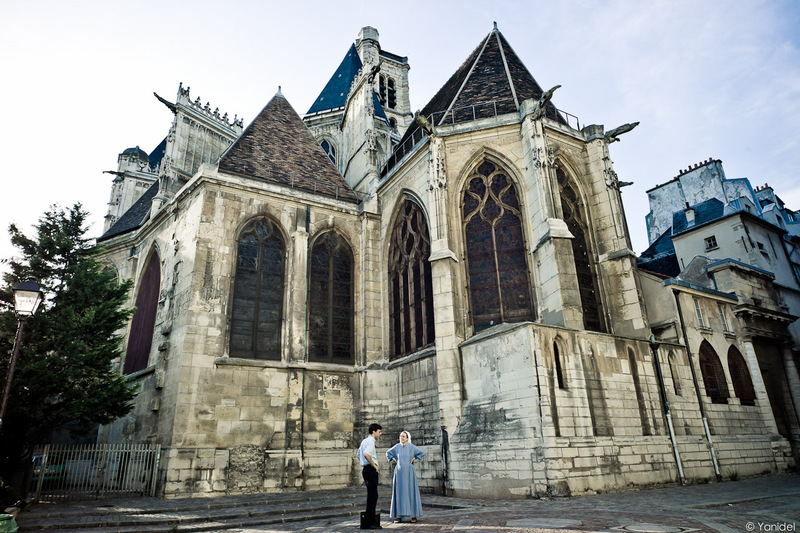 The preach in Le Marais – Leica M9 with 21mm CV Voigtlander. Good words all converge to the sky, right ? I am surprised too, I guess most people see technology as a help, not a drawback in correcting pictures. 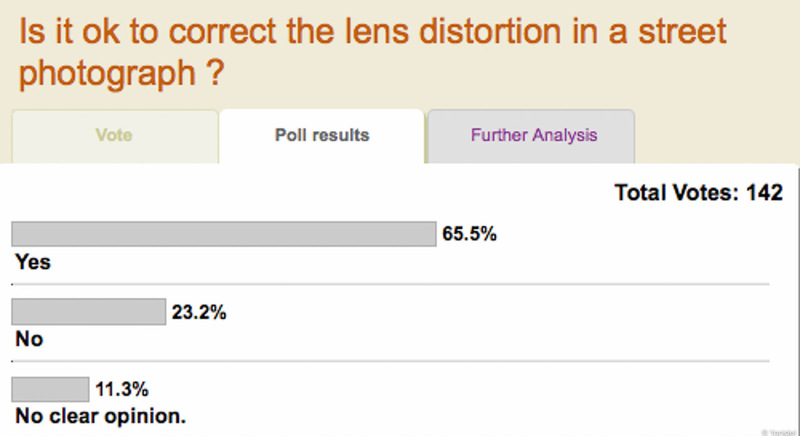 If you start correcting distortion, where does it end? Sorry, accidentally sent off too early! I think your question is not so easily answered. "I do not post-edit my photographs in any way." Statements like that make me smile. Some people may be lured into thinking that this photographer must be a truly great one, no post-editing at all! What most people are not aware of is the fact that of course you don't need post-editing if your camera is programmed to do all the editing for you, before you ever get to see the image. And this may well include correction for lens distortion, among others. Now, is a photographer who shoots RAW, turns features like "sharpening" off, a lesser artist because he wants to decide how sharp to render that picture in post-processing? Just imagine Ansel Adams sending his negatives off to the drugstore – or even a professional printer – to have them printed out of house, thus being able to say "no post-editing" done? I guess we all know how much time Ansel spent working on his prints, dodging and burning, and what not? He was a master of both taking pictures and making sure the prints reflected his vision. So, why is there so much negative press about using Lightroom or Photoshop to do the same post-editing Ansel Adams did in the darkroom? I think it is really up to the photographer to post process as he pleases, yet there are some forbiddens in my opinion, especially in street photography : adding or removing key elements of a picture. Well, if you check the dictionary, distortion is defined as: "A change in the shape of an image resulting from imperfections in an optical system." My opinion is, if the effect was not meant by the photographer but is caused by limitations of the equipment, by all means edit. And I think this is the perfect stance to take. You are exactly right.